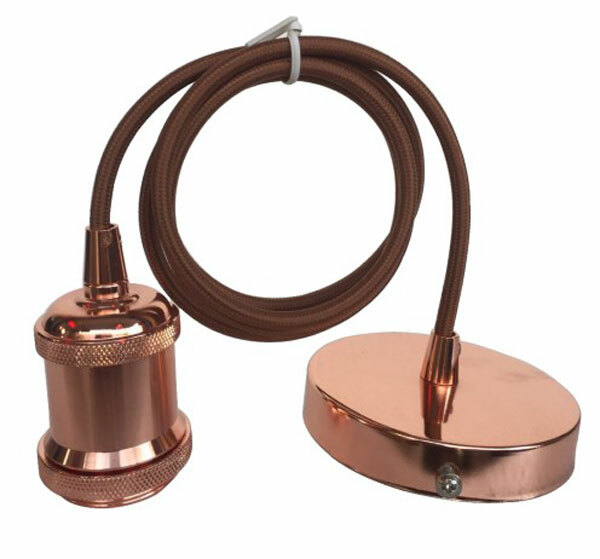 This rose gold finish ceiling pendant cable set with an E27 – ES lamp holder and shade ring features braided brown flex. Maximum drop 2.0m but can be shortened at the time of installation by cutting the cable. Maximum wattage is 100w or determined by the shade maximum wattage. Circular rose gold ceiling mount and braided brown cable suspension, with E27 lamp holder and shade ring. Now you can display any shade in style using this replacement pendant suspension. Maximum shade weight 2.0kg.